Danny Kavadlo is one of the world’s foremost authorities on calisthenics, nutrition & personal training. 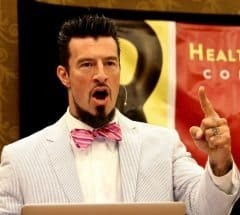 He is the author of the #1 Amazon best-selling titles STRENGTH RULES and DIAMOND-CUT ABS, along with the underground cult-classic EVERYBODY NEEDS TRAINING. Most recently, he co-authored STREET WORKOUT along with his brother Al. I first met Danny Kavadlo along with his brother Al in February 2014 at the Progressive Calisthenics Certification (PCC) that was run at Read Performance Training in Melbourne, Australia. However this was not my first experience of the famous Kavadlo brothers, as I had watched both Danny and Al on various YouTube videos and then through the images that were emblazoned on such books as ‘Convict Conditioning 2’ & ‘Pushing the Limits’ where both Danny and Al brought their unique styles and personality’s to those images. Having me Danny I can tell you that he truly is a character. Danny has a raw edge to him yet at the same time is welcoming, warm and engaging. With a huge amount of energy and passion for what he does he is a truly inspirational figure. 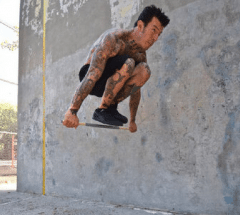 Can you give our readers a little bit of a rundown how you came to this point of being an Personal Trainer, Author, Master Instructor for the PCC as well as being a respected figure in the Calisthenics Community? I started working out when I was a kid, maybe 11 or 12 years old. Real basic calisthenics like push-ups and sit-ups. I tried all types of modalities, but always came back to bodyweight. It wasn’t until adulthood that I realized I could do it for a career. Before becoming a fitness professional, I was a musician, a delivery guy, an exterminator, a truck driver, a clown and a spring break emcee. It’s been quite a life. I decided to become a personal trainer at age 31, when my son was born. I wanted to do some good for the world. Within a very short time, I became the top trainer at my gym, then the fitness manger, until I was promoted to the manager at the biggest gym in the company. There are proven methods for success in the personal training industry that I discuss in my book EVERYBODY NEEDS TRAINING. In fact, my success in the personal training business is what led to me becoming an author. While there were many books on the market about the science of training, there were none that actually talked about doing the job in a realistic way. So I had to write it myself. Since then, I’ve also written DIAMOND-CUT ABS, STRENGTH RULES and most recently, STREET WORKOUT, which I co-authored with my brother Al. Dragon Door is the company that publishes my books, along with Al’s books and the Convict Conditioning series by Paul “Coach” Wade. By this time, Al and I had developed an online following because we were two people who could not only do some advanced calisthenics moves, but also had the training background and articulation skills to break it down and demystify it. So when Dragon Door needed lead in instructors for PCC, it was a no-brainer. That’s the long answer. The short answer is that I worked really hard for a really long time. I never expected any of this. I just wanted to do a job that means something. Given the success of the PCC’s and your books how do you manage to balance your working commitments & the associated travel with being a single father? There are many times when there are calisthenics events that I do not attend because I have plans or commitments with my son. That’s my choice. There are times when I could further my career if I spent more time on Youtube or doing bootcamps or devoting more time to work, but I choose not to. Quite frankly, my relationship with my son is more important to me. That’s not to say that I don’t dedicate ample time to to my work or training—I have to! It is simply to state that we all choose our level of involvement in all capacities of this life. Everyone’s life and circumstances are a direct result of their actions. In addition to fatherhood and work, I also want to have fun experiences, eat good food, sip fine wine, feel real love, travel and have meaningful friendships. That’s also why I train: to feel better and have greater joy in my world. Keep it simple. Basic moves like push-ups, pull-ups, squats, lunges and dips are the most important ones. It’s very easy today to see crazy moves on the internet, and then try to emulate them. While that is certainly a good thing, I still recommend getting down with the basics first. Don’t show me moves ‘til I see reps. Along those lines, we should all focus on our own progress, not the progress of others. Be patient. Nothing is achieved without hard work, discipline and consistent effort over the course of time. Also, don’t take any of this stuff too seriously—It should be fun! What’s it like being able to work alongside your brother Al on something that you both have a great passion for? It’s awesome to work with Al! Obviously, we have a lot in common. But also, as anyone who has seen us present together will attest to, we have a very good rhythm together. This is a combination of our natural rhythm and thousands of hours of honing our craft together. And, yes, like you said, we are both extremely passionate about teaching and practicing calisthenics. It provides for a very exciting environment. And since we love what we do so much, it seldom feels like “work” in the traditional sense of the word. I’m the luckiest guy I know. Lastly what does the new year hold for Danny, I assume there’s a lot of PCC’s already scheduled in, are any other big plans that you can shed some light on at this stage? At this juncture, we are scheduling more PCC’s in North America, Europe and Asia. I’m also doing several speaking engagements at various forums. There are a few more book projects in the works too, but I don’t want to say too much about that… for now! Talk is cheap, you know? I prefer to let the music do the talking, so to speak. Thanks Danny, I know you are extremely busy so our readers and I greatly appreciate you taking time out of your schedule for this interview. Thank you Jason! I see you’ve been very busy yourself. I am very pleased to see how much you’ve accomplished in the last few years since we’ve met. Keep on killin’ it my friend! *If you want to see or read more from Danny here are links to his Website, YouTube Channel and Facebook pages.